The first book was great, so I imagine this one will be amazing also. I can't wait to take a peek inside because I have been collecting the light fabrics. Perhaps this will give me a reason to cut into them. Family, friends, quilts and food – what else is there in life?? I really need this book in my library….. I love quilt books – just reading them makes me happy. Cheryl's book sounds like a fun book I need for my collection. Thanks for the chance to win it. The it's okay if you sit on my quilt book looks really cool! Thanks for sharing! I trust you…if you say it is a good book and your favourite, then that is good enough reason to want one! Add me to the list of others who want it…please? The book looks Great! That's why I need it, please! I love waking up to an inspiration this morning. Thanks, Lissa. After seeing the cover of this book…the soft calming colors (my favorites)…the awesome photo shot…the title and the amazing sub title so dear to my heart, this is a book I know I will love. There are so many great quilting books being published and to help me decide which ones to use, I really appreciate the reviews of other quilters. So I would love this book because you are recommending it! I need this book simply because I can never have enough quilt books and the cover is beautiful! it's been so very long since I bought a quilt book and this one looks fabulous! I am crossing my fingers it's me! I have that Diane Leone book and I took a class from her many, many, oh so many moons ago in mountain view. I love looking through and reading quilt books! This seems like a wonderful book to read with beautiful projects to create! Thanks for the chance! Cheryl Arkison's designs are great and I love quilt books with food in them also! 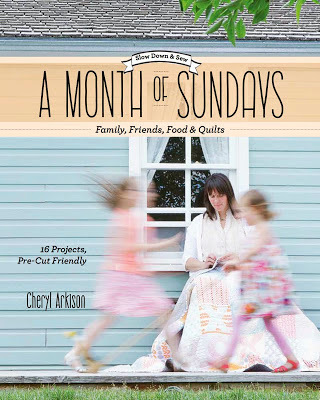 Family, friends, food, and quilts – I love them all so must need this book. I just love the title. Wouldn't it be marvelous to enjoy 31 Sundays in a row?! It looks like a lovely book – thanks for the chance. THANK YOU SO FOR OFFERING A GIVEAWAY OF SUCH A NEAT BOOK! I COULD SURE USE THIS FOR NEW FRESH IDEAS! Another book to add to my growing list. This blog hopping is getting expensive. Thanks so much for recommending A Month of Sundays! I have not seen this book. I love reading and studying quilt books. This is one that I will add to my list. Happy Friday! I need some motivation to be quilting each and every day! I'd love to have a copy of the Book, thanks for the giveaway on this Nat'l Book Lover's Day. I need this book because those four things are my life! 🙂 What a lovely blog you have, and thanks for being generous, too! I love quilt books and this one looks like an especially beautiful one! Please pick me! What a fun idea for a blog tour–reading and quilting are my two favorite past-times. I'd love to win your quilt book give-away! I just checked out the preview of that book on Amazon – it looks like great fun! Someone REALLY knows how to kick back and live. Looks like a great read, thanks for the give away. Would love to have the book, because just like fabric, one can never have enough!! I have decided that since I am the only quilter in my family that I am going to make all the nieces and nephews quilts – starting with the youngest who is 6 and working up… Trying not to think of how many this will be… I am SURE it will take me a month of Sundays but I am up to the challenge! What would be better than A Month of Sundays Quilt Book! Thank you for the post – I have learned about so many fun quilty reads along the way. I need this book because it is my birthday(8-11)and you can never have too many beautiful quilt books! I need this book because I love family, friends, food and quilts! I "need" this book because I don't like to cook ~ and I need all the help I can get (with the "food" part)!! 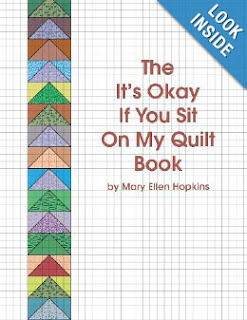 Love the name of the quilt book,"It's Okay if You Sit on My Quilt Book." How cute is that? I need this book because I've known Cheryl through on-line groups for about 15 years. I've got the first book, and I need the second, and any future books that she writes! I need this book to remember the days when Sunday was a day to be with family and friends and enjoying food. Sunday was such a good day. Sadly the stores are opened, people are working and running around and not enjoying life like it use to be. Sunday afternoons are like heaven. There's nothing like that time to relax and enjoy time with family, take a nice nap, stitch on a quilt or bake a nice batch of cookies. Low volume quilts are so intriguing and I would love to try one. This book would be a great guideline for giving it a whirl. I have heard Cheryl at a trunk show last year. I did not realize her new book was out! Loved the first one. I would live to win it! Who doesn't need a great book about food, quilting, family and friends. With all that, what more could one need in life? 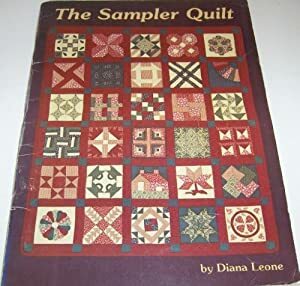 My first quilt book was "The Sampler Quilt." We were supposed to put them together using Georgia Bonesteel's lap quilting method. Mine is in the attic. I have all the blocks made for a king quilt and some of the blocks are quilted and I think I have one row finished. Oh, my, the back is plain muslin and shows everything. That's the way we did it then. It's a long story as to why it's unfinished and in the attic. Many, many years later I found out from the person who hurt my feelings over it, it was all a misunderstanding. Thanks for sharing your inspirations. Don't we all need another book – you never know from whence a great idea will emerge. Need this book? Can you ask why we WANT this book? It looks like fun! It looks lighthearted, and mostly, it looks like I don't have it in my library (yet).